The closing date for these applications is 2pm on 8th September. There will be further phases of selections in tranche two. The phase two (2) advertisement will be sent on the 29th September and the advert for phase two (3) will be sent on 27th October. The selection for Pendle will be in just under two weeks, on Thursday 7th September. It will be in the form of a closed primary - the first second to our knowledge - which means that any local party members and those willing to register as Conservative supporters will be able to vote. Andrew Percy: City Councillor in Hull, splits his time between teaching and working for David Davis MP. Andrew Stephenson (pictured): Councillor in Macclesfield, Chairman of Tatton Conservative Association and Area Officer for Cheshire and Wirral. It is worth pointing out that at the last election this ethnically diverse seat had a female Conservative candidate and this time the A list (version 1.0) has brought two white male candidates called Andrew! For more info on the candidates or to register to attend, go to ChooseYourCandidate.com (which was previously used for Sefton Central's open primary). Pendle will, in effect, be the last of the first tranche of constituencies to select a candidate. 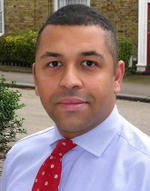 James Cleverly (blog) was the Conservative candidate for Lewisham in 2005 and is now on the A-list. He works in magazine publishing and has been a officer in the TA for 15 years. A snake has two ends (and a middle, which we will ignore for the sake of simplicity) the head end and the tail end. The head end has teeth and poison, the tail end has a bum and sometimes a rattle. If you had to pick up a dangerous snake your instincts would tell you to grab it by the tail, where there are no teeth and no poison. If you did this, the snake would simply twist around, double back on itself and bite you. But fight your natural instincts and grab the snake by the head you would see that the snake could twist and squirm all it liked but it wouldn’t be able to bite. This is counter-intuitive, grabbing the snake by the tail should be safer, surely. It isn’t. Sometimes taking the hardest course of action is actually the safest move. Clearly this cannot be used as a blanket rule, a steam iron has a hot-plate and a handle, I probably don’t need to go on. The skill is recognising when you are dealing with a snake situation and when you are dealing with an iron, so to speak. If you are making a courageous move always ask yourself "am I grabbing the wrong end of the snake?" "When the party membership elected me their leader, they knew what they were voting for. I made it clear from the outset that under my leadership we would take positive steps to tackle the scandal of women’s under-representation in the Conservative Parliamentary Party. It is of course unfortunate that we need to discuss candidates in terms of their gender and ethnicity, as if these factors matter more than their character or abilities. Commentators on this thread have made much of the reforms being anti-meritocratic. But does anyone actually believe that meritocracy has applied in the past? It cannot be that the Parliamentary party is 91 per cent male and 99 per cent white, because the men who apply to be candidates are 91 per cent better than the women, and whites are 99 per cent better than minority ethnic candidates. The sad fact is that we have not been open to all the talents of the country in the way that a properly meritocratic party should be. Under-representation of women and black and minority ethnic candidates is not the case at the local level, where Conservative Associations and Conservative councils are far more representative than our members in the Commons. So this is a national problem and it requires a national solution. Since the changes Francis Maude and I introduced in December 2005, there has been a considerable improvement in our representative profile. 32 per cent of newly selected candidates are women (compared to 9 per cent of MPs), and 9 per cent minority ethnic (compared to 1 per cent of MPs). So we’re on the right track – but we need to move faster. Today I announced further changes which give party members the power to choose the shortlist of four candidates – at least half of whom must be women. The local executive will then be able to hold in-depth interviews with the four candidates, in order to identify the one with the skills most suitable to the task of representing the constituency. Furthermore, associations will be able to choose to hold an open primary, and seats with less than three hundred members will be expected to do so. As this suggests, the changes are not, as many commentators have said on this site, a centralising move, depriving members of their rights. Local people will still choose the local candidate, from a list drawn up by the local party. And the use of open primaries makes this a more, not a less, democratic process than the one it replaces. Finally, it will help address the issue that ConservativeHome has identified – the under-representation of candidates with backgrounds in the public sector and in the regions of the country where we have few MPs. I hope that members will not see this issue in terms of local power versus central power, but as a necessary change to improve the way that local associations select candidates. The aim is clear: we must make our benches in the Commons more truly representative of the country we aspire to govern. It is about fairness, it is about better representation for women – but above all it is about effectiveness. We will only be a really effective political fighting force when we are using the talents of all our people." The early editions of the newspapers are online (see Times and Guardian) and they contain details of David Cameron's tough new measures to increase the number of women candidates. The new measures will delight modernisers and many of those members who want to see a 'Wysiwyg' politician that is determined to deliver on his key pledges - one of David Cameron's being to create a parliamentary Conservative Party that looks more like Britain. At the same time the measures will appall party democrats who value the freedoms of grassroots members. Editor's note: "These reforms are deeply disappointing. It appears that the party leadership has learnt next to nothing from last year's failed attempt to rob rank-and-file members of their say in the election of Tory leader. Unless Association Executives agree to a discriminatory all-women shortlist then rank-and-file members will lose the final say in who their candidate will be. CCHQ expects volunteer activists to devote years of fundraising and envelope-stuffing to the party but they no longer trust them to choose their parliamentary candidates. This move will do nothing to increase party membership. "Constituency officers from selecting seats would be invited to a meeting with Bernard Jenkin, which would take place in DC's offices. DC would drop in on these meetings whenever possible - and they would be coordinated with his diary." If they do not choose an open primary method of selection - which is what ConservativeHome now strongly recommends as the only way of members retaining a meaningful say in selections - grassroots members will only be left with the job of identifying three or four candidates from a field of approximately 12 to 15. These meetings will either last impossibly long or are unlikely to give members much time to assess applicants' relative strengths. There does not appear to be anything in the new set of proposals to address the issue of financial exclusion - a long-held concern of this website. David Cameron's office has offered to submit an article to ConservativeHome later today about the proposed changes to candidate selection. I hope after this editorial we'll still receive that article! I hope the Conservative leader will use any contribution to address this issue of candidates' costs and the need for a fuller definition of representation. If the Conservative Party is to really look more like Britain it must also include many more people with northern backgrounds, for example, and with experience of the public and voluntary sectors." Reports in The Sunday Times, Observer and Mail on Sunday all point to a renewed attempt by David Cameron to increase the number of female Conservative MPs. The number selected so far falls well short of the 57% target that David Cameron's office set for the first round of selections and is no better than the ratio of women in the fast-tracked (pre A-list) seats. "We have made good progress but there are still a few stick-in-the-muds who find it hard to accept that a woman has as much right to be an MP as a man. We are absolutely determined to have a very large number of women candidates, and not just pay lip service to the idea." "This is an insult to women. Every woman MP has to be able to look every male MP in the eye, from the Prime Minister down, and know she got there on the same basis as they did. This wretched process is creating two classes of MP: those who have beaten off all competition to get there, and women who have had their paths artificially smoothed. Neither Margaret Thatcher nor I needed this kind of help to get into Parliament. I have spoken to some women on the 'A' list and they have said they hate it and regard it as patronising, but realise they have to go along with it." Editor's note: "We must wait and see the detail of what David Cameron brings forward but none of the newspaper reports suggest that the party is moving beyond 'face deep diversity'. ConservativeHome has long argued that the party is not made hugely more representative if we swap southern male barristers for southern female bankers, for example. Real diversity will depend upon active recruitment of candidates from the north and those who have been homemakers or have worked in the public and poverty-fighting sectors. ConservativeHome recently published an analysis which showed that it cost an average £41,550 to become a Tory MP. We proposed modest reforms including (1) reducing the cost of attending a Parliamentary Assessment Board, (2) an emergency access fund for candidates in financial distress and (3) the appointment of a 'candidate's protector' in every seat who would help the Association to understand the financial pressures facing their candidate. It will be interesting to see if the party is going to take these or similar ideas on board. The most encouraging ingredient of Mr Cameron's reported reforms is greater emphasis on open primary elections. Not only do they downgrade 'macho' skills like oratory but ConservativeHome also believes that open primary elections are likely to select more of the local candidates that David Burrowes has argued are the 'big swinging' candidates. Any attempt to impose half-women shortlists may backfire. Associations may, perversely, think that any woman in the final round is there to make up a quota rather than because of her intrinsic merits." The Labour party have taken the lead from the feminist Fawcett Society's recent statement and used the selection of local candidates such as Jeremy Lefroy in Stafford to attack the Conservative Party at large for not being "serious about increasing the proportion of women elected to Parliament." The Conservative Women's Organisation, Women 2 Win, the Vice-Chairman for Women, the Shadow Minister for Women & Equality and the Women's Policy Forum (set up at the start of the year) apparently don't count for anything. The attacks focus on the percentage of men selected who weren't on the A list which is high but account for just over a sixth of all candidates selected. By their criticism of the process, the Fawcett Society are presumably advocating centrally chosen candidates to be forcibly parachuted into seats, in true New Labour style. Just 9% of current Conservative MPs are female, but over 30% of candidates selected in winnable seats so far are female - it's both unfair and misleading to gloss over this marked improvement. Cllr Jeremy Lefroy, the only one of the shortlist of three not on the A-list, was selected at a meeting of local Conservatives an open primary tonight. Cllr Andrew Stephenson was the runner up, followed by Maggie Punyer. Jeremy was the candidate in 2005 for nearby Newcastle-under-Lyme. He is Treasurer of Newcastle under Lyme's Conservative Association and a co-founder of Equity for Africa. Stafford MP David Kidney (Lab) has a majority of two thousand. Debi Jones has been selected tonight to fight Sefton Central. She beat off close competition from three other Councillors from the region: Alf Doran, Adrian Owens and Andrew Stephenson (the only A-lister). [ConservativeHome has now learnt that Debi is on the A-list top-up (1.30pm, 11/8)]. Party activists and members of the public, mostly elderly, packed out Crosby Civic Hall for what was the fourth open primary parliamentary selection to have ever been held (Eltham had one at the end of July). The process wasn't expensive, and advertising in the local press was in effect doubled by their coverage of the process. Members of the public could read about the candidates and sign up to attend using a unique website, ChooseYourCandidate.com. On the night, the candidates' names were picked out of a hat to determine the order in which they were interviewed individually by Liam Fogarty. Each session lasted half an hour, and included five set questions from the audience. After three knock-out votes, Debi achieved the mandatory 50% of the vote. Debi was the candidate for the similar seat of Crosby in 2005. Other than that she is best known for hosting the afternoon show on Radio Merseyside for five years, her local charity work, and for recently becoming a local Councillor with a big swing. Rather than merely being re-selected internally, she can now say that she was selected by "the people" - in sharp contrast to the incumbent Labour MP who was initially selected from a centralised all-woman shortlist. This popular mandate should help in the new part of the constituency in which there are few remaining party members who would have had a say in a closed selection. "One thing I am going to do is reform our selection of candidates for by-elections, so we can clear up any confusion there might be. I want to make it absolutely clear that when we have a by-election we have a priority list - an A-list, if you like - for that by-election and that should include candidates who may be on the priority list, who may be on the general list that we have. It may include local candidates who have never thought about being politicians before. That list should be drawn up by Central Office on the one hand and the constituency on the other. It may include as few as two or three candidates and then it will be voted on by the local party and they will choose the actual candidate. We can then clear up that all candidates going forward for a by-election are, in effect, A-list priority candidates, whether they have been on a list before or not." Asked about the letter sent to A-listers who had applied to a small number of seats: "All the people on the A-list were written to and reminded that it is very important that they do apply for seats when they come up." About the number of women chosen under the A-list so far: "I think that's progress. I would like us to do better and I will be looking carefully to see how the selections go. I always said that in the middle or end of August, when the first tranche of selections have gone through, I would have another look at how the system was working." The Observer's Oliver Marre has written a piece about Adam Rickitt this morning. I hesitated writing this as Marre's nonsense doesn't deserve any publicity but some people have emailed me about it and it's important that it is refuted. I have just spoken to Adam Rickitt and he refutes three central 'facts' in the article: (1) he doesn't have a spokesman, (2) he has met David Cameron, and (3) he is a paid-up Tory member. Adam is still determined to pursue his ambitions to become a Tory MP. It would be difficult for The Observer to have got many more things wrong in such a short piece. Adam Rickitt has been the top punch bag for many of those people who have disliked the A-list but he deserves truthful and fair treatment and The Observer and Oliver Marre, in particular, should be ashamed of themselves. "We are sorry to have to write to point out that you did not apply for many seats in the first tranche of selections. Being a priority candidate is a privilege which carries obligations. In the letter appointing you as a priority candidate, we made it clear that priority candidates do have a responsibility to apply for as many seats as possible. We said in our letter on your appointment that priority candidates who fail to demonstrate commitment or who fail to apply for suitable seats without giving good reason may regrettably have to be removed as a priority candidate. Therefore we would appreciate it if you could inform us that you will apply for a good number of seats in the next tranche, or whether an impediment exists to your applying for these key seats. If you would like to come and see either of us or Gareth Fox to discuss seat selections, then please do get in touch. We look forward to hearing from you soon." Some A-listers - Zac Goldsmith and Nick Boles - are understood to have failed to apply for any of the first 35 selecting seats. The initial letter of appointment to the A-list warned that status did "involve an immediate commitment on your part to apply for as many of the winnable seats as you feel able". This failure of A-listers to apply for any or 'enough' seats contributed to the decision of some seats to postpone selections because of lack of applicants. Some A-listers have spoken to ConservativeHome in recent days and believe that the letters reflect unrealistic expectations of candidates. These A-listers have applied for only two or three seats but (a) do not want to apply for faraway seats and (b) cannot afford to apply for any more than one or two seats each month. This expectation of A-listers fits into ConservativeHome's 'cost of being a candidates' analysis - published to wide acclaim earlier this week. 7.30pm: This from the BBC. "Robin Walker is the new Conservative candidate hoping to become Worcester's next MP. The 28-year-old described himself as "the happiest man in Worcester" when the party announced his name of Friday night. Clearly enthusiastic and excited to be a step closer to the seat his father, Lord Walker, once held for more than 30 years, the young politician has been a Tory campaigner since he was a toddler..."
Contrary to press reports the A-list top-up is probably closer to fifty in number than one hundred (although sources within CCHQ are giving ConservativeHome slightly contradictory messages). Listed below are the names of people who ConservativeHome understands to be on the A-list top-up. If you know of someone on the list please email [email protected]. Editor's confidentiality guarantee: Publishing the first A-list caused ConservativeHome's traffic to double. It was, of course, the list that nearly every Tory wanted to see. I always tell people, however, that the list of people who told me who was on the list would have been a more interesting one! I say this because I want to underline that I always respect the confidentiality of sources. Always. The first A-list was published here. NO COMMENTS WILL BE POSTED UNTIL THEY HAVE BEEN CHECKED BY THE EDITOR OR DEPUTY EDITOR. It has been a nervous time for the Conservative Party's approved candidates waiting to hear if they have been promoted to the A-list. Letters went out on Tuesday to all of those people who had been promoted in the top-up and I know of a number of candidates who have been anxiously awaiting the morning post. CCHQ decided not to send all candidates a letter. For the sake of a 23p postage stamp the candidates' department could have afforded candidates the courtesy of a note that explained that they weren't on the list. They might even thought of sending an email. "Since the original 'A' List correspondence I think I am right in saying that not a single letter or email has been sent out to non 'A' List candidates, apart from those exhorting them to help in various by-elections. Some candidates have not even been alerted to the fact that a seat in their locality is selecting - should candidates really have to learn about this from ConservativeHome? This is not the way to keep people motivated. There needs to be a complete rethink about the way the Party communicates with its candidates - who are, after all, the 'poor bloody infantry'." "The priority list assessment panel met late last month and letters have now gone out to those who have been promoted to the list of priority candidates. When we wrote to you in April, our letter stated that we would inform you if your status as a candidate had changed. Letters were posted 1st Class on Tuesday 1st August, so I am sorry to say that unless you have received a letter then your status will not have changed. Inevitably, some of you will be very disappointed. This does not mean that your commitment to the Party and your hard work is not appreciated and valued. We do hope you will continue with this. There will be a further top up of priority candidates after the Conference in October, so if there are any particular factors that you think the panel should consider at that time, do please submit this via email and it will be placed on your file." Bernard Jenkin's comment to this morning's Guardian: "It was only ever a very long shot that 50% of new MPs would be women. We are making substantial progress - barely 11% of our new MPs were women last time and we are going to double or treble that." Editor's comment: "David Cameron wants to build a more representative party but that only appears to mean more women and more ethnic minority candidates. Other forms of 'diversity' - including action to help lower income candidates - are not being meaningfully pursued." Editor's comment: "An A-list of nearly 200 candidates is not the elite list it was once presented as." Who is on the top-up? A report in today's FT confirms the rumours... The A-list top-up is underway and, in what amounts to a considerable dilution of the initial list's aims, the top-up may be as large as 100. If you know of someone on the list or are on the list yourself please email [email protected]. Editor's confidentiality guarantee: Publishing the A-list caused ConservativeHome's traffic to double. It was, of course, the list that nearly every Tory wanted to see. I always tell people, however, that the list of people who told me who was on the list would have been a more interesting one! I say this because I want to underline that I always respect the confidentiality of sources. Always. As featured in this morning's Telegraph, Financial Times and Scotsman. Guardian Online, the Daily Mail and the BBC have also since posted reports. In aiming for a more representative Conservative Party David Cameron has consistently emphasised the need for more women and people from Britain’s ethnic minority communities. The fact that more than 50% of A-listers are women - and that 10% are from ethnic minorities - was about the only thing that CCHQ wanted journalists to know about the ‘Priority List’ when it was launched. ConservativeHome has always believed that ‘candidate diversity’ should have other dimensions. We believe that older candidates have something special to give to the parliamentary party and Iain Dale made a strong case for candidates with good life experiences in a special post in January. A bigger theme for ConservativeHome, however, has been the value of recruiting candidates with backgrounds in the public and voluntary sectors – or other people who, perhaps because they have been homemakers or carers, have limited incomes. Robert H Halfon and Katie Perrior have both written for ConservativeHome about the financial pressures on candidates. A few weeks ago ConservativeHome invited existing candidates to submit their own experiences of the financial costs of seeking to become a Conservative MP. I am very grateful to the 17 A-listers and 20 other candidates who took the trouble to email me with their experiences. I hope, as they read my all-too-short analysis, that they will think I have done some justice to their experiences. 4. Lost income from the whole process. The total cost for the winning candidates was £41,550 when lost income was included. It was significantly less - £27,235 – for losing candidates (partly reflecting the fact that some candidates were unlikely to win their seats and consequently spent and sacrificed less). Average cost of fighting a seat (with lost income included): £34,392. When considering direct costs only the cost was £22,020 for winning candidates and £16,070 for losing candidates. Average costs (only including fees, housing, travel and other direct costs): £19,045. "The cost of becoming a candidate is not cheap and the process is a fairly prolonged one. Help may be at hand for candidates, however, in the form of a new and cost effective media training facility called Westminster Communications (part of the Synergie Group) located in the heart of Westminster. A facility that you can book (by the hour, half day or day) to simply brush up on your performance before a selection or media interview or pitch yourself into a more intense scenario by being grilled by a panel of media experts with instant TV analysis. At the end of the session you walk out with a DVD. Westminster Communications have all of the facilities to simulate press conferences, radio interviews, phone-ins, door-step interviews and journalist off camera briefings as well as being able to offer a network of the top media coaches and groomers in the business. If you’re interested they can be contacted via [email protected]. ConservativeHome has not received money for this recommendation and has no financial interest in Westminster Communications. Tim Montgomerie, Editor of ConservativeHome, knows the people behind the venture and could not recommend them more highly.